I offered to take something back to the PX that my husband bought and decided he didn't need. He said we could ride together because he had to go on base anyway. I said, "No, we can drive separate. I need to run in the commissary also." He said, "Okay go ahead and take it, but I might see you over there." He wasn't sure but he might have to drop off a photo CD to someone who worked there. "Can I take it?" I offered. 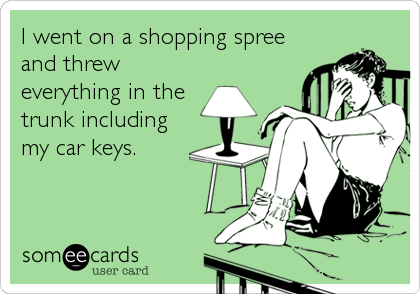 I really wanted to go in the PX by myself because I had been eyeballing a purse. I wanted to go in there and stare at it. Justify it. Love it. Buy it. Bring it home and throw it into the bottom of my closet for it to appear later. So I raced to the PX, quickly returning the item that needed to be returned. I went to stare at the purse, loved it and quickly justified the purchase saying, "It's so pretty." I rushed to the register, bought it, then peered out the entrance of the store. No husband or friends of husband in sight. I dashed across the parking lot, opened the trunk of my car and threw everything in. I looked around the parking lot looking all Barney Fife - smug and satisfied. Then I looked at my hands and I was only holding my cellphone. So before I called my husband, I thought about how I was going to answer the annoying question, "How did you manage to lock your keys in the trunk?" All I could come up with was to bark the response, "I DON'T KNOW!" So I called. "Are you still over at Youth Sports?" He said yes and asked me why. A wonderful truth just rolled off my tongue, "I locked myself out of the car." He came and unlocked my car with the remote. I opened the door and stood there talking to him for a minute before he went inside the PX to deliver the photo CD. I said, "See you at the house" as I proceeded to get in the car like I was getting ready to drive off. When he was out of sight, I popped the trunk, jumped out of the car, got my purse and keys then raced home. Here's the thing... when I threw the bag in the bottom of my closet the thrill was gone and I felt super guilty. The purse didn't even appeal to me anymore. I didn't love it either. I returned it the first chance I got, when I remembered that I forgot to go to the commissary. This post is linked up with Finish the Sentence Friday, January 31, 2014.